I loved this book, and I love the author. Which seems the only reasonable response to such a calm, considered and candid tale of the author's life, and to her plea that we should love ourselves the way we are. Hillman - or, if I may, Thea finds herself to be a part of the intersex community, and yet she is also very much part of a global community that includes us all. Thea recounts her life story in short chapters with single-word titles, unfolding and reflecting on a growth that wasn't linear. I found it difficult to put this book down, but kept reading one more, and one more, and one more chapter. Anything I write here about Thea's thoughts and conclusions will sound mawkish by comparison to her words. I felt very much included, as she reflects that so few of us feel the neat fit between our biology, gender and sexuality that is expected by society. And so I don't think she'd mind if I wish for a wider application of her wish, "for our community ... that during this very confusing and amazing time, we be gentle with ourselves, and with each other." 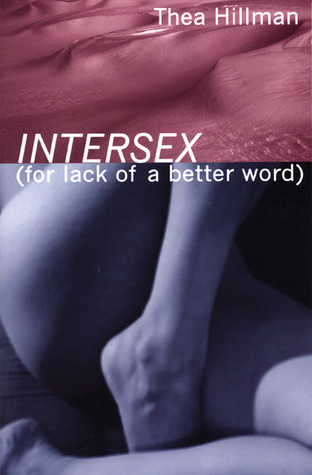 Sign into Goodreads to see if any of your friends have read Intersex.